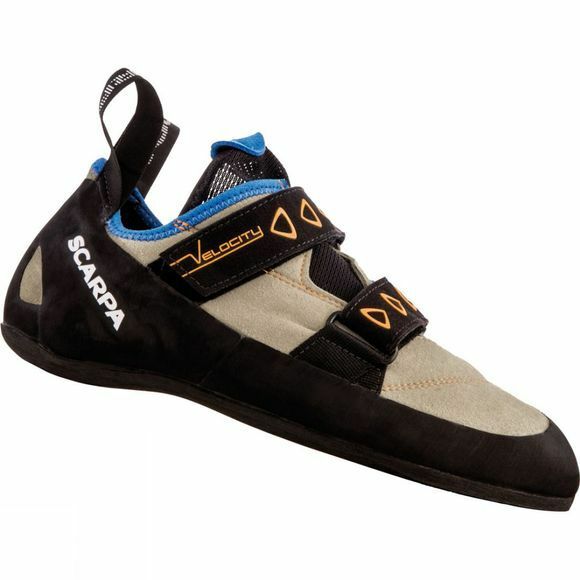 Scarpa have designed the Velocity V Climbing Shoe to be an all rounder that can be suited to beginners as well as experienced climbers alike. They are sized with comfort in mind, but more experienced climbers are able to size down to achieve a more precise and technical fit. The flat footed profile is relatively easy on the feet, and will appeal to novice climbers and those more experienced who are looking for day long comfort. The two opposing velcro straps are quick to secure and release, yet give a firm hold around the foot, making the Velocity a great indoor wall shoe.